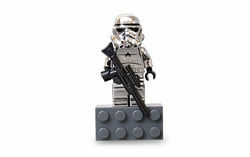 4560075 Silver Stormtrooper Magnet was released in 2009 as part of the LEGO Classic Star Wars line. Included is a magnet with a silver Stormtrooper minifigure and a rifle. The magnet was originally sold for $12.99 at LEGOAND California, however it was posted on LEGO Shop@Home.com for $9.99. The magnet set was originally labeled as item number 4560076, but when it was released on LEGO.com, it was posted as 852737 LEGO Star Wars 10th Anniversary Stormtrooper Magnet. In February 2010, a promotional polybag containing only a Silver Stormtrooper minifigure was released and given away in Spain as the set 4591725 Chrome Stormtrooper. In the week of March 14, Toys 'R' Us gave out a free exclusive chrome strormtrooper (not magnet) whenever you spent $11.99 or more on LEGO Star Wars products. Facts about "4560075 Silver Stormtrooper Magnet"
This page was last edited on 15 March 2016, at 05:46.